When we looked at Vienna Solo Strings a few months ago, mention was made of the ways in which its audio samples can be controlled… parameters changed; presets configured and saved; sound properties experimented with, and so on. By default VSL’s bundled Vienna Instruments usually handles such control; you are referred to that review for this context.. If you want greater flexibility and more features, though, VSL also has the very reasonably-priced Vienna Instruments PRO, the recently-released version 2 of which is examined here. Vienna Instruments PRO 2 claims to be the “most powerful sample player on the market”. If by “power” speed and functionality are meant, then that claim has much validity. But the product (which can be used both as a “plug-in” and as a standalone application) has many other features which also make it a real contender for the title. Its greatest strength is probably the ease with which visual representations of audio parameters can be so easily controlled. As well as the vast range of those variables. Most musicians won’t want for anything in flexibility and features with Vienna Instruments PRO 2. When you add to that the product’s robustness and reliability, it’s a real winner. A Vienna Key “dongle” and the (software for) eLicenser are necessary to register your instance of Vienna Instruments PRO 2. The procedure is similar to that described in the MyMac review of Vienna Solo Strings. With the product come utilities to install Vienna music samples, to uninstall the software and locate (already installed) samples using VSL’s “Directory Manager”. You’ll also notice a much faster startup time – dramatically faster… as little as 10 seconds or better – with Vienna Instruments PRO and Vienna Instruments PRO 2. Several features are entirely new in Vienna Instruments PRO 2: the ability, for example, to extend the range of each articulation by up to two whole tones up and down by grabbing the handles on the virtual keyboard. This is but one of dozens of examples of how well designed Vienna Instruments PRO 2 is, how much thought and feedback have informed the way the new interface has been designed to fit the workflow of a creative musician. 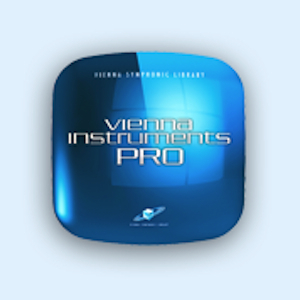 What’s more, Vienna Instruments PRO 2 works seamlessly with much other software beyond versions of Vienna Ensemble such as Sibelius, Pro Tools, Logic or Cubase, for example. 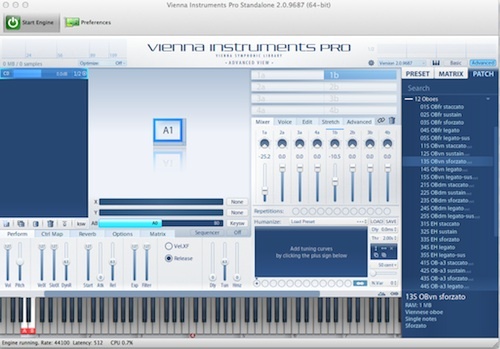 Vienna Instruments PRO 2 exists as a standalone application (there is an onscreen keyboard, which you’ll also probably want to use for testing even in the plug-in environment). And as a “plug-in”, as the integrated component in other Vienna software like Vienna Ensemble and Vienna Ensemble PRO. In both cases Vienna Instruments PRO 2 has two forms of interface: Basic and Advanced. The Basic view really does have every control and parameter that you’re likely to need on a regular basis. The Advanced one not only builds on what you’ll have become familiar with when using the Basic view; but also makes some very sensible assumptions about how and where to add the extra (though by then potentially just as necessary) controls which it supports. In each case, these are all easy to use, flexible, well-designed and all guaranteed to be conducive to a smooth, effective and easy-to-remember workflow… each icon, button and entity on the screen has a tooltip, for example. Legends are clear and readable. VSL also provides a number of clear, and precisely-focused tutorial videos which show the suite in action. The Basic View has eight assignable real-time controllers; preset information; a list of the matrices; views of each matrix; the “current patch” display; Matrix Controls and the “File Browser” to locate which sample you’re working on. The Advanced View has these and – additionally: a “Velocity Histogram” with optimize controls, output meters; a slot editor area and slot rack; Repetition Control; the “Humanize Area” and an information window. Significantly, all matrices, cells and slots, “Humanize” and filter settings as well as mixer parameters, keyboard envelopes, range settings, controller mappings and Realtime Controller Area can now be copied and pasted across and between samples – even across different and separate Vienna Instruments PRO 2 instances. It’s not hard to imagine how much of an advantage this is to work where more than one sampled instrument (or patch thereof) has to be configured. This flexibility (which works well in use) is typical of the vast improvement which VSL has brought to Vienna Instruments PRO 2 over the basic Vienna Instruments. It alone could justify the cost of the upgrade. But it’s also in half a dozen other specific aspects of sample control that the real advantages of Vienna Instruments PRO 2 are to be found. When experimenting with assigning articulations to settings, it’s vital that the process be as easy and transparent as it can… repeated actions benefit from as much transparent automation as possible. In this version of the software, Auto Cell Naming lets you identify all the articulations you have loaded by their cell names. Then use those names. Most significant of the changes is perhaps the “Humanizer” (Human Performance Control) which allows you to introduce slightly offbeat timing, slightly sharp/flat notes and other effects which make your music sound less as though it were created by a machine and more by a real, fallible, human player. Further, the “Auto Humanization” controls allow you to assign appropriate settings at the same time to all of your loaded articulations. More evidence of flexibility in the service of the way musicians actually work. 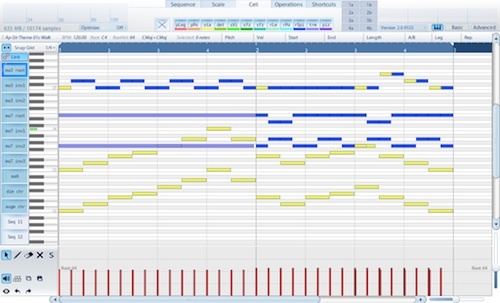 Similarly to save time and repetition, the internal Auto-Playback and Pattern (APP) Sequencer gives you a huge number of orchestral patterns and voicings. Because of the design of Vienna Instruments PRO 2, triggering (rhythmic) routines with their accompanying parameters for multiple instruments is achieved with minimal effort. This also allows you to load hundreds of preconfigured chords, phrases and patterns. Again this minimizes dragging and dropping in use and experimentation. You have more time to compose and/or play. To be specific, you can selectively enable/disable the cells for certain articulations with simple clicks. RAM is handled much more intelligently as a result, although the settings you’ve made for patches are kept. Vienna Instruments PRO 2 optimizes hardware in another way – it takes advantage of Solid State Drives (SSD). Even the most powerful machines can be slowed with the amount of data required by massive audio samples. In testing this feature of Vienna Instruments PRO 2 really did cut loading times by up to 90% when used with the ‘mid-2011’ iMac’s 256GB SSD allocation. The Microtuning Scale Editor lets you change the pitch of specific notes of your scales to customize your microtunings. Not something that everyone will want. But for those who do, invaluable. Polyphonic Legato lets you play chords using Legato Performance Patches; although Vienna Instruments PRO 2 still does afford maximum control to the user: you can override a global polyphonic setting with a specific monophonic one if and when you need to. The Auto Playback and Pattern Sequencer allows you to create substantial libraries of sounds… typically, orchestral patterns, sequences and arpeggios all corresponding to specific matrices and articulations. Again, typical of VSL, the vast array of orchestral patterns and one-touch chords all in their correct voicings, synched runs and proper phrasing (for all instrument groups) adds to the degree of realism which Vienna Instruments PRO 2 brings to your music making. Enveloped Time Stretching is again aimed at increasing your scope for expressive playing. It enables you to discover which part of an articulation needs to be manipulated in order to adjust, for instance, the speed of a portamento or the attack of a staccato. There is a lot to learn in order to make the most of Vienna Instruments PRO 2. It’s a complex piece of software. Yet VSL has struck a compelling balance between a mass of features, controlling them admirably via presets, naming routines and a superb graphical interface that really brings audio concepts to life on the one hand; and allowing quick manipulation of these parameters during the course of your work on the other. The thoroughness and example-packed nature of the well-designed documentation aids usage of Vienna Instruments PRO 2 in every way. Where there is a potential conundrum or scope for confusion or ambiguity, the documentation’s writers have anticipated as much and guide you through – largely because they too are musicians. The advantages of Vienna Instruments PRO 2 over the free/bundled Vienna Instruments are legion. For serious control of orchestral (and chamber) music making, it’s far and away the best choice. As suggested, a lengthy evaluation period mostly with Avid’s Sibelius 7 on 10.7 revealed no hitches or malfunctions. Just as significantly, use of the product materially enhanced workflow and creativity. Conclusion: Vienna Instruments PRO 2 can be unreservedly recommended as a useful, powerful and reliable upgrade from Vienna Instruments. In all aspects of its performance and integration with those environments in which you are likely to use it, it worked flawlessly while being evaluated. It has been well-conceived, well-designed and brings a host of useful, needed and time/effort-saving functions to your work with Vienna Virtual Instruments. PROs: Very fully-featured; robust; easy to use once the basic concepts of Virtual Instruments are understood; clear and workable user-interface given the complexity of some of the operations which it performs; well-documented (although the direction of the slashes in filesystem paths in the manual is incorrect for Mac users!) and supported; integrates perfectly with other (VSL) products; very well-priced. Cons: None to speak of. Because it is a complex product with many interacting parameters, VSL advises familiarity with the original Vienna Instruments first. Do Apple’s Education Announcements Pave the Way for the ePad? Kontakt 9 Komplete has the same technical specification Intel Core 2 Duo and runs well on my 2012 mac mini ,then this plugin should runs well too ,right ?